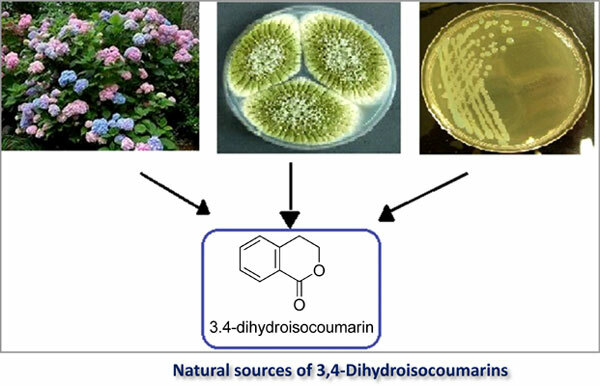 Background: 3,4-dihydroisocoumarins are an important small group belonging to the class of naturally occurring lactones isolated from different bacterial strains, molds, lichens, and plants. The structures of these natural compounds show various types of substitution in their basic skeleton and this variability influences deeply their biological activities. These lactones are structural subunits of several natural products and serve as useful intermediates in the synthesis of different heterocyclic molecules, which exhibit a wide range of biological activities, such as anti-inflammatory, antiplasmodial, antifungal, antimicrobial, antiangiogenic and antitumoral activities, among others. Their syntheses have attracted attention of many researchers reporting many synthetic strategies to achieve 3,4-dihydroisocoumarins and other related structures. Objective: In this context, the isolation of these natural compounds from different sources, their syntheses and biological activities are reviewed, adding the most recent advances and related developments. Conclusion: This review aims to encourage further work on the isolation and synthesis of this class of natural products. It would be beneficial for synthetic as well as the medicinal chemists to design selective, optimized dihydroisocoumarin derivatives as potential drug candidates, since dihydroisocoumarin scaffolds have significant utility in the development of therapeutically relevant and biologically active compounds. Isocoumarins, dihydroisocoumarins, lactones, natural products, microorganisms, isolation.